One of the tools that most shaped European culture and improved life in the Middle Ages was a new type of plough. Ploughs drawn by animals to break up the earth were used as far back as 2500 BCE in the Indus Valley; however, those ploughs were simple wooden devices, mostly some form of stick or rake that would scratch the surface of the earth so that seed could be broadcast and covered with dirt. This worked well in the light sandy soils of the Mediterranean and Egypt, but the heavy, wet, clay-laden soils of Europe were another mater. Simple scratch ploughs could not make a dent in those heavy soils, laid down by glacial advance. 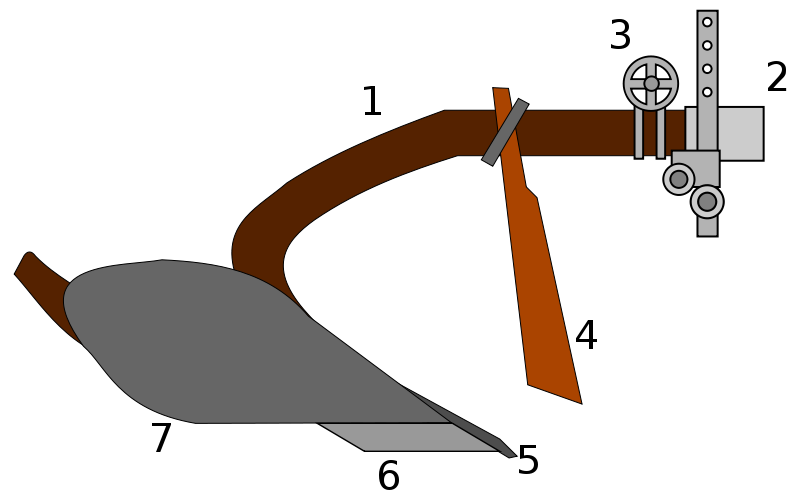 Someone devised a plough with two particular features: the coulter and the mouldboard. The coulter (#4 in the diagram) is a vertical cutting blade that cuts a furrow. That isn't enough, however. The mouldboard (#7) is a curved blade that turns a layer of earth over, exposing it and creating a deeper furrow than a scratch plough. Improvements in the smelting and shaping iron by 900 CE made the coulter, the chisel (#5), and the main share (#6) efficient so that the mouldboard could do its job properly. A side-effect of this type of plough is that deep furrows are created that help drainage. If excessive water from spring rains can be diverted from fields rather than standing in pools, planting can take place earlier; a longer growing season results, less susceptible to water damage of seedlings. Around the same time, Europe started experimenting with crop rotation. The practice of using a field every other year for a different purpose was already in place, but three-field crop rotation in which one field is left fallow began to create healthier crops and higher yields at harvest time. I will not go as far as James Burke* does and say that everything comes from the plough—predictability of future crops, pottery because you need to store grain, writing because you need to make a potter's mark, weaving because you are growing flax, et cetera—but the development of the mouldboard plough literally made a dent in man's difficulties in growing food in European soil. It contributed to population growth and to other advances in technology and civilization. 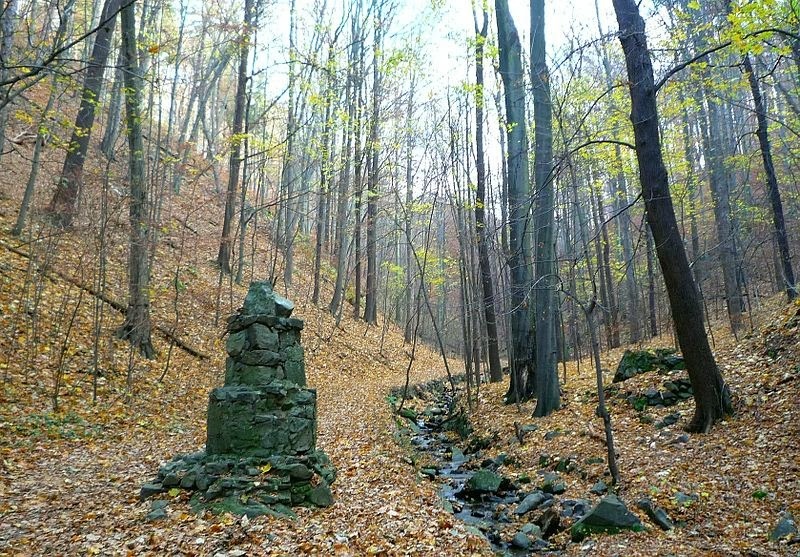 *The inspiration for this post comes from memories of James Burke's groundbreaking Connections. The first of February is the date of the Irish quarter-year festival called Imbolc. 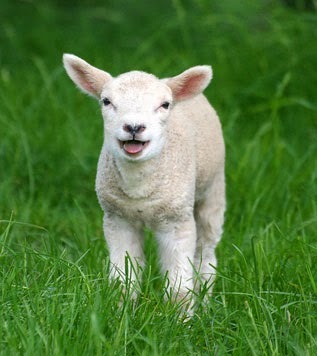 Imbolc is Old Irish for "in the belly"; it refers to the time of lactation in ewes and lambing, and was the official start of spring. Imbolc may well be a neolithic tradition [neolithic is from Greek νέος (néos, "new") and λίθος (líthos, "stone") "new stone age"; c.10,200 BCE to c.4500-2000 BCE]. In Leinster, Ireland there is a stone tomb constructed between 3000 and 2500 BCE; the rising sun illuminates the passage into it twice a year, on Imbolc and Samhain. 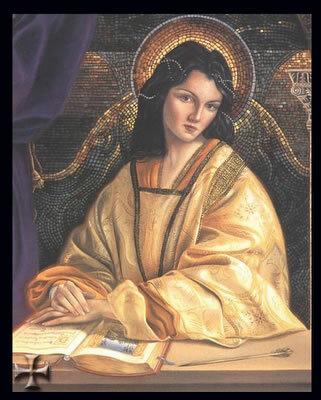 The day became connected with St. Brigid, one of the three patron saints of Ireland. * The conflation of the saint with a fertility goddess leant itself to adding a lot of rituals and traditions to the day. 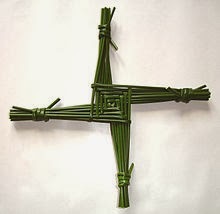 Brigid's Crosses were woven from rushes for the occasion by young females, who would carry them while singing a hymn to Brigid. Brigid would be invited into the home on the eve of Imbolc so that she would bless the house and family members. The ashes of the fire were carefully raked and smoothed that night; in the morning, they would be searched for any disturbance that suggested that Brigid had passed through. Brigid would be called upon to bless livestock for the coming year. *St. Patrick and St. Columba were the other two. Much of the United States is experiencing lower-than-usual temperatures recently—and the forecast is that there is more to come. The people reading this blog have (I hope) ready access to sources of heat and insulated housing, warm clothing and hot drinks, weather-proof shoes and knit hats. But what of folk centuries ago? How much can we know of the weather of past centuries? A Chronological Listing of Early Weather Events by James A. Marusek (2010) compiles several sources of weather data from numerous historical records. The detail is praiseworthy. Just a sample from the time of and immediately following the Norman Invasion makes me glad I was not living through those years in Europe. 1066 A.D. In England, there was a great frost. Also refer to the section 1064 A.D. – 1071 A.D. for information on the drought and famine in Egypt during that timeframe. Winter of 1067/1068 A.D. 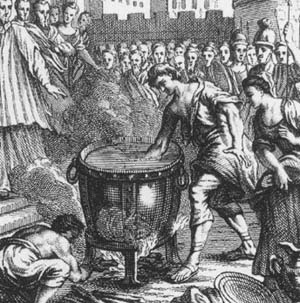 The winter in Europe in the year 1067 was long and intensely cold and many people perished by cold and hunger. In 1067, the vine and fruit trees in France were killed [by the extreme cold]. ￼During 1067-68, in France, the winter between St. Brice to St. Gregory (from 13 November 1067 until 12 March 1068) was extremely severe. The vineyards and forest trees bore no fruit. The mishap brought forth by this and the previous years infertility produced in England such a famine, that the unfortunates were forced to eat dog and horse meat, yes, even to eat human flesh. In France, a terrible winter began on 13 November 1067 and lasted until 12 March 1068. In England in 1068, there was famine and plague after a severe winter. 1069 A.D. The rivers froze in the north of Germany. In the year 1069 in Germany, the winter was harsh and long. There was a shortage of wine and fruit because of the extreme cold. The rivers were frozen over. King Henry IV came to the countries of the Saxons and caused such carnage that the area was depopulated. In 1069, the Normans desolated England, and in the following year famine spread all over England, “so that man, driven by hungar, ate human, dog and horse flesh;’ some to sustain a miserable life sold themselves for slaves. The contributions of the Muslim world to astronomy are many, and I have only briefly touched on some of them (such as here). There were nine Muslim astronomers in particular who made major contributions. One of them was the Iranian Abd al-Rahman al-Sufi (7 December 903 - 25 May 986). His name indicates that he was a Sufi Muslim, like Rumi. 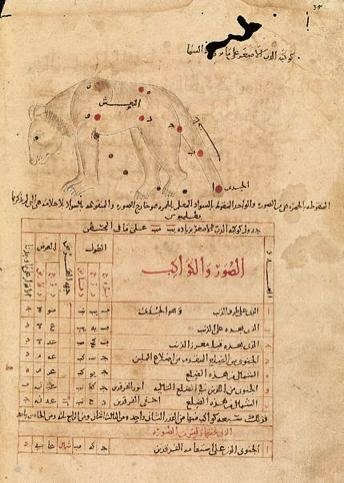 al-Sufi translated and expanded on the work of the Greeks, especially attempting to reconcile the Greek and Arabic star charts and constellations. 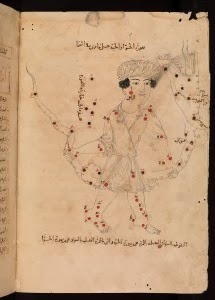 In 964 he published Suwar al-Kawakib al-Thabitah, the "Book of Fixed Stars. "* In it he gave the latitude and longitude of hundreds of stars for the year 964 from two views: from both the exterior and interior of a celestial globe. The oldest surviving manuscript known is in the Bodleian Library and was created about 1009 by al-Sufi's son. There was no English translation of this book until 2013. "the little cloud" that we call the Andromeda Galaxy. a "nebulous object" in Vulpecula, now called "Al Sufi's Cluster"
He also describes the astrolabe and lists a thousand uses of it. The significance of al-Sufi's work led the astronomical community to name other objects after him, such as a a lunar crater (Azophi) and 12621 Alsufi, a minor plant in the asteroid belt with a period of 2000 days. *There is an argument that he could not have known of the Magellanic Cloud until the same time as Western European astronomers in the 15th century because of its position in the Southern Hemisphere. 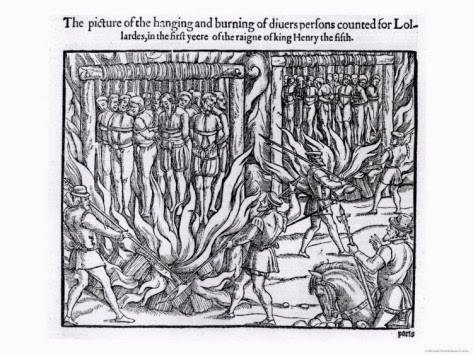 In 1401, during the reign of King Henry IV of England, Parliament passed a law known by the phrase, De heretic comburendo ["Regarding the burning of heretics"]. Heresy was always a concern, going back to Pelagius and Arius, but England had a new threat in the Middle Ages, in the form of John Wycliffe, whose attempts at reforming the church and politics did not sit well with those establishments. True, by 1401 Wycliffe (c.1324-1384) had been dead for years, but his ideas had inspired a movement called Lollardy, and his plan to bring the word of God into the hands of the masses via his English-language Bible ran the risk (according to Church authorities) of leading the faithful astray by giving them the chance to read Scripture without the proper learning to understand its precise meaning. Something had to be done; something proper and legal—after all, England was a country governed by law, not whim. This statute stayed on the books in England until 1677. The most gracious Lord King Charles then held an assembly at Worms. From Worms he marched first into Saxony. Capturing the castle of Eresburg, he proceeded as far as the Irminsul, destroyed this idol and carried away the gold and silver which he found. What was the Irminsul? Rudolf of Fulda, who wrote histories that include the biography of Saint Leoba, defines irminsul in his De miraculis sancti Alexandri ["On the miracles of Saint Alexander"] as "universal column, upholding all things." The irminsul was a pillar made either from a tree trunk or stone and used as a focal point of worship in non-Christian Europe. Records do not exist that would let us zero in on its meaning and purpose; it is simply clear that it was a symbol of paganism and a site of worship. Attempts to determine the meaning of the name are inconclusive—none are met with universal agreement. The name irminsul, as well as the presence of a Germanic tribe Irminones (mentioned in Tacitus' Germania), suggest that there was a Saxon god named Irmin. Some scholars suggest that Irmin was an epithet of Odin, some say Tyr. the peasants all bowed before him"
There were likely irminsuls in many locations, constructed of different materials; see the picture above for the remains of one. The best known one was probably that mentioned in the Royal Frankish Annals above, destroyed by Charlemagne. The consequences of that act are worth a look; but that's for tomorrow. 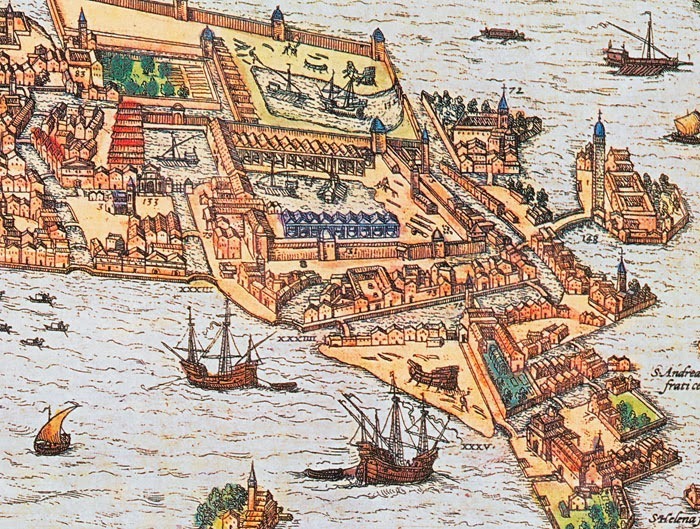 The Arsenal is probably the first example of large-scale factory work prior to the Industrial Revolution. The complex grew to cover 110 acres, and had a forest dedicated to its lumber needs. The workers, called arsenalotti, numbered in the thousands at the height of production and were said to be able to produce a ship in less than 24 hours. One of their techniques was to build the frame first rather than the hull first. Once the frame was finished, different crews could move in with their pre-fabricated parts for assembly. Rigging, sails, weapons, etc., were prepared by separate teams for the appropriate type of vessel. Dante even mentions this process in Canto xxi of Inferno. These specialists also made improvements in technology, particularly in weaponry. Gunpowder weapons—bombards and handguns—were a particular interest. Much of the complex is now in ruins, but you can see the Porta Magna, the "Great Gate" that provided the seaward entrance, here. *Some day I promise to get to my favorite Crusade, the 4th, and how it went horribly wrong. In Greek mythology, Æther was the offspring of Erebus (deep shadow) and Nyx (night). Despite springing from dark parents, the word is related to the verb that means "to incinerate";** "æther" was used to refer to pure fresh air, something more pure than ordinary air; in fact, a pure air that was breathed by the gods. Plato's Timæus (which was very popular for medieval scholars, as I've mentioned before) and his student Aristotle both considered æther crucial to the structure of the universe. Aristotle called it the "fifth element" and described its superiority over earth, air, fire and water because it did not have their limiting properties (hot or cold, wet or dry) and was unchangeable. It was also called quintessence which means "fifth essence/element." The Greek philosopher Plotinus (c.205-270) taught that there was a supreme "One" that existed prior to all created things, was synonymous with "Good" and "Beauty," and was like a light shining in a void. To the medieval Christian mind, Plotinus was describing God, and therefore was one of those non-Christian philosophers worth listening to. Plotinus said æther was immaterial and could be moved through; he also said there was no such thing as empty space. The scientific theories were there for all to read and understand. To be totally honest, the "ether" being tested for in the Michelson-Morley experiment was not conceptually the same æther discussed so extensively in classical and medieval times, but the descent from one to the other clearly runs through the philosophical writings of Western Civilization. Æther was here to stay, until modern technology could eliminate it from our worldview. *With a nod to Brian Koberlein (on Google +) for shamelessly stealing this idea and his title. **The name Æthiopia was coined because the inhabitants were black-skinned, as if burnt by the sun. In Dante's Inferno, the eighth circle is reserved for sorcerers, astrologers, and false prophets. There the narrator sees Michael Scot. You might think, if someone were so well-known after his death, that we would know more about him. Well, we know a little, but we have some cool stories. Every astrologer is worthy of praise and honor, since by such a doctrine as astrology he probably knows many secrets of God, and things which few know. This was not likely to endear him to the Roman Catholic Church. 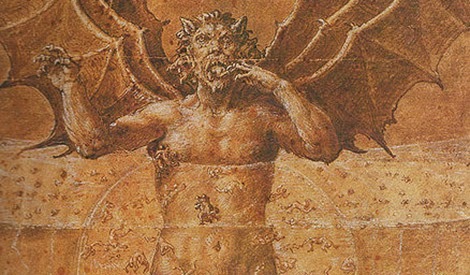 Although he was known in his lifetime as a brilliant Aristotelian scholar, and Fibonacci's Liber Abaci was dedicated to him, his books on alchemy and astrology and the occult sciences earned him a reputation for magic. A Bronze Age circle of stones in northwest England called "Long Meg and Her Daughters" was supposedly a coven of witches turned to stone by Scot. Other stories have him hosting feasts served by invisible spirits. Boccaccio refers to him in the Decameron as a magician. It is also told (long after the fact) that he predicted he would die from a small stone falling on his head from a great height. 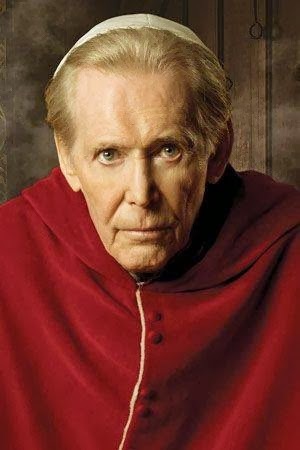 He always wore an iron cap to prevent it, but he removed the cap when entering a church one day (more not to stand out than for reverence of God, we are told), and a small stone of the size he predicted fell on his head. He picked up the stone, recognized that his prophecy was coming true, put his affairs in order, and died of the head wound shortly after! His reputation (helped by the dearth of facts) has made him a prime subject for fiction right up to the present day. *From a fresco painted between 1366 and 1388 by Andrea Bonaiuti in the Cappellone degli Spagnoli of Santa Maria Novella in Florence. 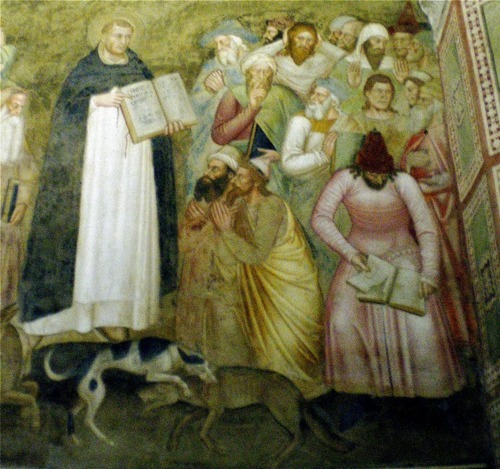 St. Dominic preaches to the crowd. When Anna Comnena was born in 1083, she tells us in her history The Alexiad, she was presented with the trappings of a ruler, a "crown and imperial diadem." This might have been appropriate, since she was the only child of the Emperior Alexios I. Once her brother John was born in 1087, however, Alexios had another option, and John was proclaimed heir in 1092. 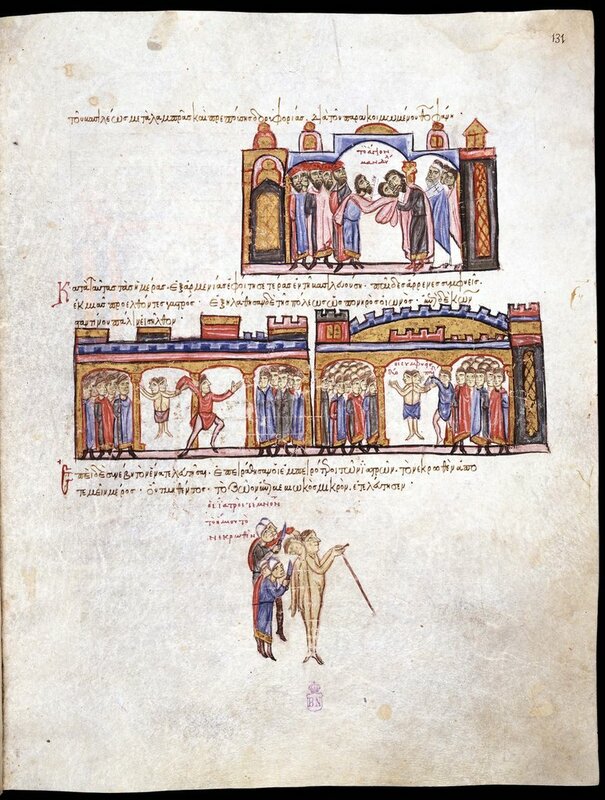 Alexios became ill in 1112, turning the administration of the empire over to his wife, who in turn handed it to Anna's husband, Nicephorus Bryennius. The emperor recovered, however, and lived to fight more battles. In 1118 he had an attack of rheumatism so severe that he was incapacitated and unable easily to draw breath. Anna was there, offering her medical opinion along with multiple physicians. By placing their hands on the emperor, they detected multiple irregularities in his arteries. After several days of growing inflammation and difficulty breathing and swallowing, he died. At this point, The Alexiad ends; accounts of what followed come from historical accounts later in the century. John was proclaimed Emperor John II Comnenos. 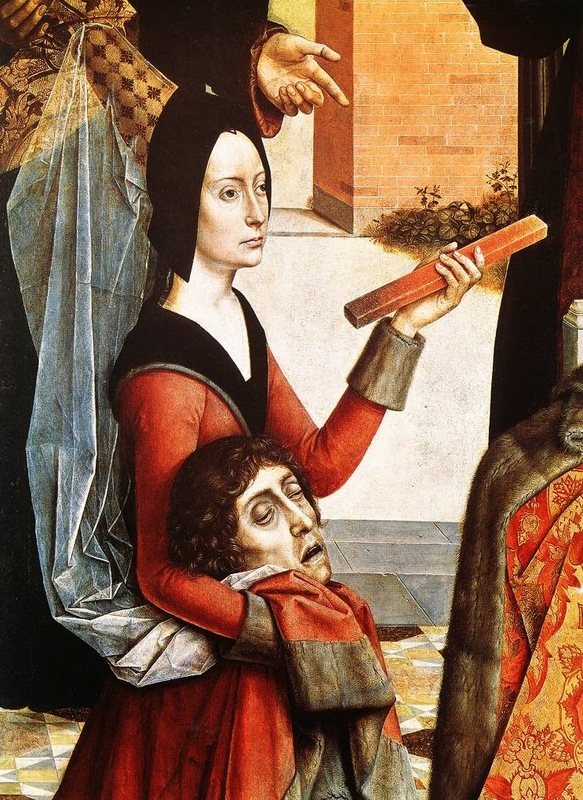 An unsuccessful attempt to murder John took place at the funeral; some modern scholars assume that Anna must have been involved. In fact, we are told by people decades after the fact that Anna attempted to usurp the throne from her brother and place her husband on the throne, so she could reign as empress at his side. There was an interesting precedent that makes this believable. Nicephorus' father (or grandfather; there is some confusion in the records) had, many years earlier, attempted to take the throne from Emperor Michael VII. The attempt failed, largely because of the efforts of the young man who would grow up to be Emperor Alexios I. In the present case, however, we are told that Nicephorus was not interested in the conspiracy to overthrow John. Anna's response (remember: this was said years later by someone who never knew her) was that "nature had mistaken the two sexes and had endowed Bryennius with the soul of a woman.” The Empress Irene, we are told, also had no interest in overthrowing the rightful ruler, for all that we are told she favored her daughter. Nicephorus and John actually had a decent working relationship, and accompanied him on a Syrian campaign in 1137. Nicephorus fell ill, however, and returned home early; he died shortly after. Anna, after his death, retired to a convent that her mother had founded, where she began her 15-volume history. A long time ago (it seems) I touched on gravity and said "there was no working theory of gravity yet; just a feeling that substances could be heavier or lighter." Theories of gravity did not need Newton to become useful to understanding the world. The Middle Ages understood that objects inclined toward the earth itself, wherever they were upon its spherical surface. In fact, gravity was sometimes described as "kindly inclining." Dante (1265-1321) in his Inferno has his traveler and guide (Virgil) descend through the levels of Hell—not a metaphorical journey, but descending deeper and deeper below the surface of the Earth—finally reaching the gigantic body of Lucifer embedded in the ice. They start climbing down his body when, at his groin region (the bottom-most part of the world), down becomes up, and they have to reverse their orientation. They are now climbing up to his feet. Was Dante just speaking metaphorically? Did he understand gravity as it operates at the center of the Earth? Maybe he did. Vincent of Beauvais (c.1190 - 1264) wrote an encyclopedia that was very popular in the Middle Ages. It is not unexpected that Dante would have been very familiar with it. Vincent was well aware of the spheroid nature of the Earth, and that objects fell directly to Earth no matter where they were on the surface. In his Speculum Naturale ["Mirror of Nature"], he explains as much of the world as he can in 3,718 chapters spread across 32 books. In Book vi, he tells the curious what would happen to a stone dropped into a hole that goes straight through the globe to the other side. He says that it would not fight gravity and rise to the other side, but would stay at the center. The acceptance of a terrestrial globe forced scholars and philosophers to re-think the action of falling bodies and their relationship to the Earth. Common sense led them to arrive at the proper effects of gravity, even if they did not have the science or mathematics to understand the cause of gravity. Clearly, Old New Year is still a big deal! Today, 14 January,* is the "original" New Year's Day in the Julian calendar at the time that the Gregorian calendar was devised to replace it. (This switch was discussed in several places, most notably here and here.) As can be expected, not everyone adopted the new calendar system right away. Some hung onto the Julian calendar for a long time; in fact, it wasn't until 24 January 1918 that Lenin made the Gregorian calendar the law of the land in Russia. By the early 20th century, the Julian and Gregorian calendars were separated by two weeks (not the 7 days that were the case centuries earlier in the time of Gervase of Canterbury, or even the 10 days that were the case in the 16th century when a whole chunk of October disappeared from European countries). It turns out that Lenin did not actually change New Year's Day in Russia so much as he created a second one. 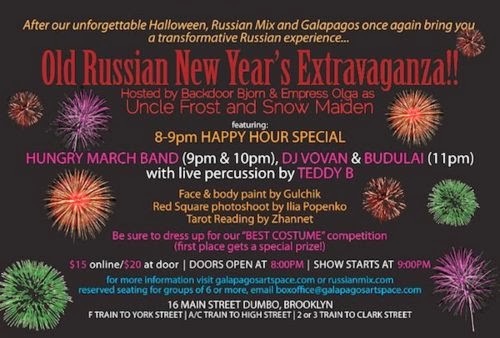 In Russia it is the Old New Year, a day of nostalgia and feasting. In the Eastern Orthodox liturgy, it is the Leave-taking of the Christmas season: the final "wrap-up" of Christmas. The Old New Year is still remembered in Serbia, Georgia, Bosnia-Herzegovina and Ukraine. It is celebrated in Wales as Hen Galan ["old new year"] (at least in Gwaun Valley in Pembrokeshire) when children receive sweet treats and sing carols. Likewise, some parts of Switzerland keep up the old tradition of Alter Sylvester, described and illustrated here. Thanks to the refusal of protestant countries to change their dating systems based on a Roman Catholic idea, some very old customs have survived into modern times. *Sometimes Old New Year is the 13th. Today presents many opportunities to tie into previous posts. 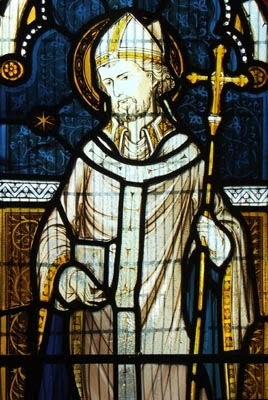 It is the date of the deaths of St. Rémy in 533, of Abbot Suger in 1151. It is the date of riots in Constantinople that destroyed half the city when the Blues and Greens fought, and the elevation of a new King of the Franks named Odo. Instead, however, let us talk about Kentigern, known to the Welsh as Cyndeyrn Garthwys, but whom the world now knows as Mungo. Although he lived in the late 6th century, no complete biography exists before the 1185 version by the hagiographer Jocelyn of Furness. Jocelyn claims he used an Old Irish document; there is a manuscript with a partial biography from the Cotton Library that might be what he refers to. If we turn to Welsh geneaological tables from the Middle Ages, we learn that he was the son of King Owain of Rheged. If we are to believe Jocelyn, Owain raped a saint, Teneu, whose father then had her thrown from a hill in Lothian; she survived, fled to Fife, and there gave birth to Mungo. In his twenties, Mungo started ministering in Strathclyde to those living in what is now Glasgow. 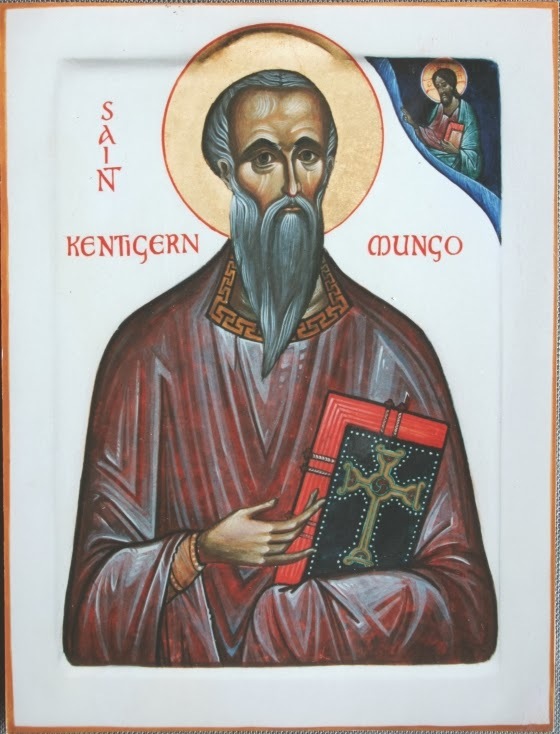 Saint Ninian had already brought Christianity to the area, and he welcomed Mungo. An anti-Christian push by a later king prompted Mungo to travel to Wales where he spent time with Saint David (c.500 - c.589). Eventually, a new king in Strathclyde invited Mungo to return. Mungo has some miracles to his name, such as reviving a dead pet robin and finding a fish in the River Clyde that had swallowed an important ring needed to prove the queen's fidelity to her husband. Mungo is said to have died in his bath on 13 January (in either 603 or 612 or 614), now considered his feast day. He is the patron saint of Glasgow. Yesterday's post on the Leiden Glossary mentioned its two chief contributors, Adrian of Canterbury and Theodore of Tarsus. Also interesting is their journey to Canterbury—not just their appointment to their positions, but what it took to get to their new jobs—and what it tells us about the Middle Ages. Bede tells the story of Adrian of Canterbury in his Historia ecclesiastic gentis Anglorum ["Ecclesiastical history of the English people"]. Adrian was born in North Africa—we don't know when, but he died about 710—and was abbot of a monastery when Pope Vitalian (who would send Benedict Biscop to England as well) offered him the position of Archbishop of Canterbury on the death of Archbishop Deusdedit in 664. Adrian turned down the offer, and suggested a nearby monk, who also declined. When the pope asked Adrian a second time, Adrian introduced to the pope another friend who happened to be in Rome, Theodore of Tarsus. The pope accepted Theodore as the new Archbishop of Canterbury, but asked that Adrian accompany him to England; according to Bede, Adrian had traveled to England twice before, and knew the way. Keep in mind that this is a world without roadmaps, without highways, without public transportation or any regularly scheduled wagons or boats or anything of the kind. On 27 May 668 (note: 4 years after the death of Deusdedit), Adrian and Theodore left Rome. They traveled by sea to Marseille on the southern coast of France (far preferable to crossing the Alps). In nearby Arles they stayed for a time with its archbishop, John, until they managed to get passports from King Clotaire III's Mayor of the Palace, Ebroin. These passports could be shown to any civil servants along the way to grant them safe passage through Clotaire's domain. By the time they made their way to the north of France, winter had come, so they needed to stay somewhere. Theodore went to stay with the Bishop of Paris. Adrian stayed first with the Bishop of Sens, then the Bishop of Meaux. In the spring of 669, King Ecgberht of Kent sent for Theodore, who reached England a whole year after he first set out. Adrian, however, was not so lucky. For some reason, Ebroin decided that Adrian might have been an agent of the Greek emperor. * The Greek emperor that he feared had died in September of 668, but news could travel as slowly as bishops crossing France, so Ebroin (and Clotaire) were probably fearing someone that had been dead for months. They finally allowed Adrian to leave France. Arriving in England, Adrian was made abbot of the monastery of St. Peter, which was re-named St. Augustine's Abbey. He and Theodore taught and wrote commentaries that, along with the writing of others, were compiled into a collection of glosses in Latin and Anglo-Saxon. At least one copy made its way to the continent and the Abbey of St. Gall, where it was copied in 800. That copy eventually wound up in the Netherlands, where it became known as the Leiden Glossary. *In 669 the emperor would have been Constantine IV, "The Bearded"; Ebroin probably feared the emperor's predecessor, his father Constans II. The Leiden University Library in the Netherlands, founded in 1575, was an important part of the Enlightenment (late 17th to early 18th century), due to its enormous collection of texts that include 2500 medieval manuscripts. One of their medieval manuscripts, the Leiden Glossary, preserves a document from 9th century England that might otherwise be lost to us. A "glossary" is a collection of "glosses," or explanations of a word or term. The Leiden Glossary contains glosses and commentaries by two priests and scholars, Adrian of Canterbury and Theodore of Tarsus (mentioned here), who were both at St. Augustine's Abbey in Canterbury. The 48 chapters are lists of sayings and phrases used by Adrian and Theodore in their teaching, as well as commentaries they made on other works: think of it as a teacher's handout to his students so they don't have to take notes. There are, for instance, 8 chapters by Theodore with glosses on the "Pastoral Care" of Pope Gregory I (Gregory has been mentioned here). There are also glosses from different people. For instance, there are three glosses on the same subject of the Historia Ecclesiastica ["History of the Church"] of Eusebius. The three are of differing quality, as if the book records the attempts by three different scholars—maybe students— to explain the passages in Eusebius. One of them echoes a different commentary found elsewhere that is known to be by Aldhelm, so it may have been Aldhelm himself who contributed it to the Leiden. 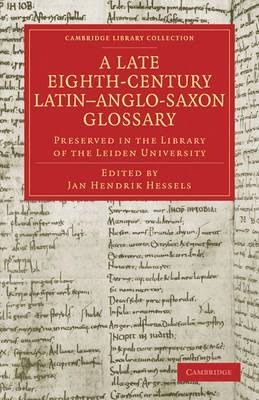 The Leiden is a mixture of glosses in Latin and Anglo-Saxon, another indication that the original glossary must have come from England. The Leiden Glossary was made in the library at the Abbey of St. Gall, presumably from that original. One of the things that we learn collaterally from the Leiden Glossary—because of the manuscripts about which the glosses have been written—is that the library at St. Augustine's Abbey must have been extensive. Alas, it did not survive the dissolution of the monasteries under Henry VIII. Hippocrates was aware of the phenomenon of conjoined twins, and offered an explanation: the male provided too much seed for just one being and yet not enough for two. Whatever the reason, antiquity and the Middle Ages were well acquainted with this occurrence. Not everyone would have had opportunity to see an example of conjoined twins—there's no evidence that Hippocrates himself ever saw or "treated" such a case—but some who did witness the phenomenon wrote about it. One eyewitness was Leo Diaconus, or Leo the Deacon. The pair lived for several years, apparently making appearances around the Eastern Empire (perhaps earning money for some 10th century P.T.Barnum). Eventually, one twin died. 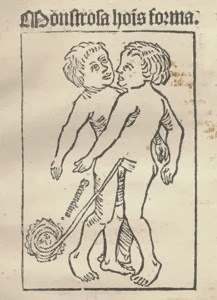 A history written in the 11th century has an illustrated page for the case of these conjoined twins. You can see the pictures here. The Byzantine Emperor Justinian was known for—among other things—establishing a code of justice. His reign, from 1 August 527 until 14 November 565, was sufficiently long that he managed to achieve many other things—enough that he earned the title Justinian the Great. When I call him a Byzantine Emperor, I refer to a geographical designation; technically, he was emperor of the Roman Empire, albeit he ruled from the Eastern Empire. The division of the vast Roman Empire made it difficult to manage the entire territory; Justinian, however, decided during his reign that it was time to bring the empire back together. Now, this might have been easy if the Western Empire were still under Roman rule. The Western Empire, however, had been overrun by Goths and Vandals. Justinian, who is sometimes referred to as the "Last Roman Emperor" because he was the last ruler who spoke Latin as his first language (as opposed to Greek), instituted a renovatio imperii ["restoration of the empire]. This restoration plan produced the Gothic Wars, lasting 20 years, Not only did he bring much of the old Roman territory around the Mediterranean back under one rule, but he also brought new territory to the Empire. 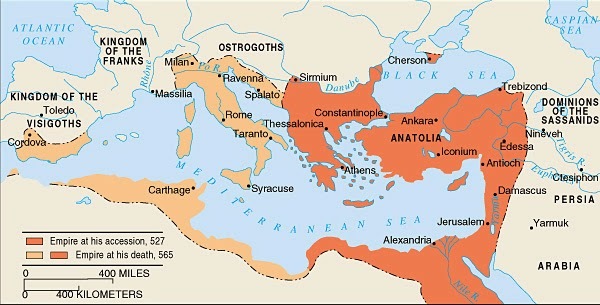 The Tzani (now called the Zans, a subtonic group of the Georgians) on the east coast of the Black Sea had never known Roman rule, but were included in his military campaigns. Over a year ago I touched on funeral practices. A recent comment on that post has sent me back to look at, shall we say, "divergent practices." The comment was very pertinent: how do we account for attitudes toward saints' relics if preserving corpses was important? Of course, bodies decay, and if Christians believed in bodily resurrection, they must also believe that resurrection would restore the decaying body to its living healthful status. Apparently, however, that belief did not include being able to re-assemble limbs if they had been separated, or restoring organs and cuts if there had been an autopsy. Research, however, shows that attitudes toward the treatment of corpses were "contextual": important bodies—ones that had religiously or politically sentimental significance—could be partitioned for special purposes. 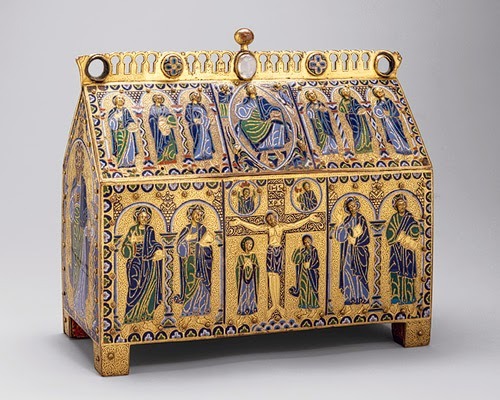 Saints' relics are the most obvious example, but there were others. When Henry III died in 1272, he was interred in Westminster Abbey, but in 1292 his heart was removed and sent to Fontevrault Abbey because of his Angevin family connections. And remember that the process of hanging, drawing and quartering was a special punishment for the worst of crimes: those who wanted to bring harm to the body of the king (and, by extension, the "body politic" of the country). Clearly, the treatment of bodies depended on various and varying cultural attitudes, as well as on the needs of the culture to get further "value" from the person by utilizing (or abusing) the corpse after his or her death. Holding hot iron in a Trial by Ordeal. In the post on Margaret Eriksdottir we saw an example of how Trial by Ordeal doesn't always work out for the defendant. People still invoked that dubious method of justice, so belief in it (and, presumably, its efficacy in some cases) kept it alive. The post linked above mentioned how Haakon III died without an heir, so a nephew named Guttorm Sigurdsson was put on the throne of Norway. He was only four years old, and so the responsibility of governing was put into the hands of regents. Guttorm only lived as king a few months, actually, dying of an illness (remember the sudden illness that killed his predecessor? it seems to have been a trend in Norwegian politics of the 13th century). One of his regents was Haakon the Crazy. To give this new Haakon the benefit of the doubt, what we translate as "crazy" would probably more appropriately be defined as "furious in battle" than "unstable of mind." He was a supporter of King Sverre (Margaret's husband), and was made regent for Guttorm and leader of Norway's armies at the death of Sverre's son, Haakon III. 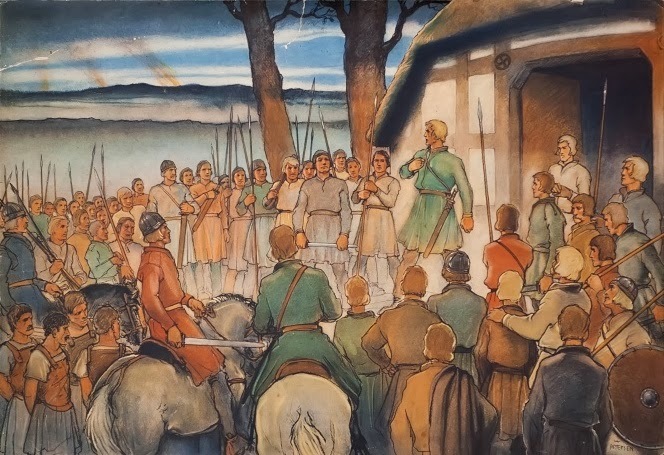 Unfortunately, he had connections with Sweden that made him unsuitable for king, so at Guttorm's untimely death, Haakon the Crazy's half-brother Inge became king. Haakon the Crazy died at the end of 1214; King Inge died in April 1217; and here's where it gets more interesting. A woman whom Haakon III had taken as a concubine in 1203 appeared in public with her young son, claiming that he was a son of Haakon III. 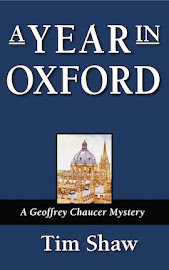 Normally, this would not necessarily carry any weight, but she decided to go through a Trial by Ordeal. She carried a piece of hot iron without apparent damage from the heat, proving before all of Sweden that her claim of proper paternity for her son was true! The boy, Haakon, became King Haakon IV and reigned from June of 1217 until his death on 16 December 1263. His reign is considered a golden age of medieval Norway. suffering burns would prove innocence. Margaret (or Margareta) Eriksdottir of Sweden (c.1155 - 1209) is only briefly mentioned in the histories of the time, but one incident in her life underscores the flaws of the medieval justice system. She was the daughter of King Eric IX of Sweden (d.1160) and was married to King Sverre of Norway (c.1151 - 1202) in 1189. Sverre fell ill and died on 9 March on his return from a military expedition. Margaret returned to Sweden after his funeral, but her daughter, Kristina, was not allowed to return with her. Sverre's successor (King Haakon III, a son from a previous marriage) kept Kristina at his court. This, presumably, caused some hostility between Margaret and Haakon. Two years later, Margaret decided to return to Norway. Unfortunately for Margaret, Haakon died very shortly after her return, and accusations of poison were made against her. Margaret invoked Trial by Ordeal* to prove her innocence, and had a man undergo the ritual in her place. Sadly, he was badly burned—not surprising to a modern audience, but proof of guilt to the law court of the time. The man was drowned, and Margaret had to flee for her life back to Sweden. Haakon died without a son, so Guttorm (a grandson of Sverre) was named king, even though he was only four years old. No one was around to carry a grudge against Margaret, so in 1209 she returned to Norway for the wedding of Kristina to one of the regents for Guttorm. Sadly, she became ill and died a few weeks after the wedding. *See the post on Trial by Combat. Peter O'Toole in "The Tudors"
In 2012, June 30th had one extra second added to it. This is only the latest in a long list of calendar corrections. We'll avoid the modern arguments about what actually constitutes a "year" (a problem resolved by designer of the Jalali calendar) and go back to a simpler time. The 1582 change gave rise to a slight oddity for historians, because technically, every date prior to October 4th, 1582 is a Julian date, but also has a corresponding Gregorian date that is several days different. How you count it depends on whether you consider the date to be just a label given by those who were there at the time, or a certain number of days prior to the present day. Or it's important if you want to declare the anniversary of an event. Anyway, the extra second was added just before midnight. You may not have noticed it, but you can say you lived at a time when a minute was 61 seconds long! *Copernicus had dedicated his work De revolutionibus orbium coelestium [On the Revolutions of the Celestial Spheres] to Pope Paul III, hoping it would save him from potential hostility for his radical thoughts. Had Paul called him, Copernicus probably would have come running to join the team of calendar reformers; alas, he had died in 1542.